Shower of Roses: A "Not So Small" Success! As I mentioned last week, my husband has been gone on a two week training session... His last day is today, and (since this particular training is only a few hours drive away) he will be home tonight! When he left I decided that, in addition to just maintaining (keeping up with the regular housework and homeschooling), I was going to try and get a couple projects completed that I've been wanting to get done for a long time. He arrives home tonight though, and I was able to finish in time! 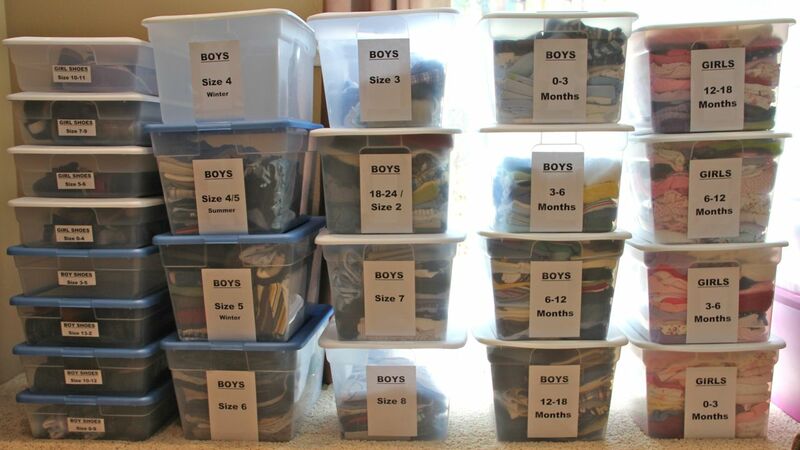 I reduced the quantity of clothing down to one storage tote per size (one for boys and one for girls) and put the shoes all in smaller separate totes. We ended up taking a carload full of stuff to donate as well. I did end up keeping two totes of size 4 boy and size 18/24/2T girls since those are the sizes that Snuggles and Rose are currently wearing, and I will reduce the quantity over the next few months, and only store what fits in the tote after they outgrown those sizes... An almost 2 year old girl doesn't really need 45+ complete skirt and dress outfits now, does she?! 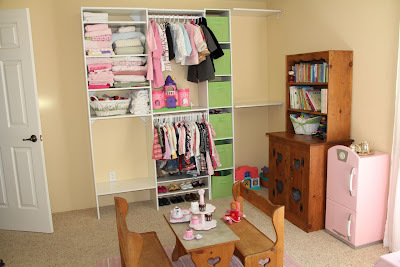 The closet organizers in the nursery are working out great so far! I still need to cut the bars for the baby's side, and get drawers and doors for the left side, but I was so excited to find the fabric drawers for Buy 1 Get 1 One Free at a local store this week! I am really hoping this will make finding and storing the clothes a little simpler. I'd love to hear how you store your children's old clothing, and how you decide what to keep! Now that I finally have this all done, I can finally get back to a few other projects I'm working on, including the plans for Little Flowers. But first I am going to relax and enjoy the weekend with my family! oh my word. that's a gorgeous storage system you have going on. I thought I was on the ball with having things put in plastic boxes in a general area, but this very admirable! Switching out the clothes every season is such a task isn't it?! This will be so helpful for you to have it organized so well. Wait...let me pick my jaw up off the floor! lol. We have been doing this very thing all week except... mine just doesn't look like that! :) Good work, mama! Bravo on getting each size reduced to one tote! I only have girls so I only have to store clothes for one gender so far. Our hand me downs are out of control because I had several years where I never met an outfit I didn't love. Then add in a few years where my oldest daughter has worn the same size for 2-3 years and you get more clothes than one child ought to have. 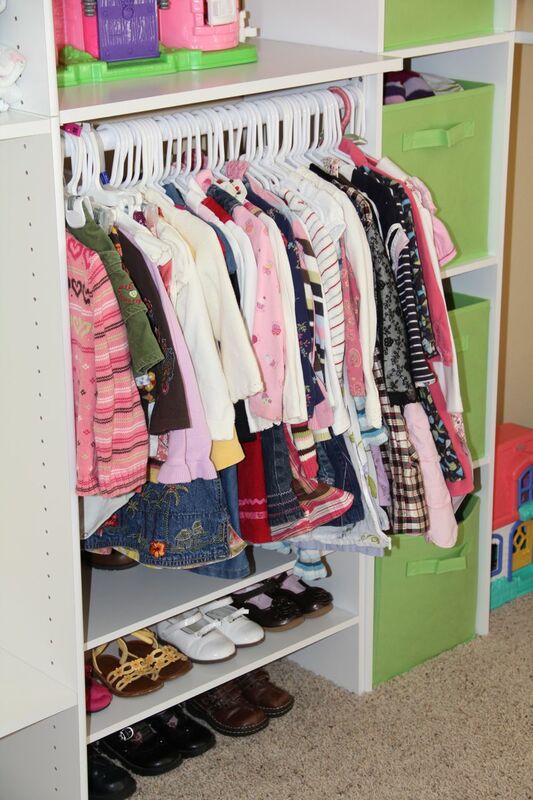 I have a closet that is packed from floor to ceiling with size 4-8 clothes, and we have overflow of hand me down baby clothes that have been given to us recently in two other closets. I'm trying to go size by size and weed out what we don't need so we can give it to another family who can use it. I also adopted the policy of not saving shoes that show excessive wear. As far as keeping clothes, I donate whatever we did not use (much of what we receive for the little ones anyway are hand-me-downs). I also donate anything starting to fray, stained, etc. I keep mostly what I really like. I don't keep shoes much except dress shoes and some slippers (depends on wear). I want to set up a list of needed clothes that I can have on hand in case I see deals and not end up overspending on clothes I don't need. Thank you everyone! I'm really so excited to finally have this done... It was such a daunting task! Sarah ~ We've always used plastic totes in one area, but as the kids got older, and we had more and more, it got to be such a mess. With our first four it wasn't such a big deal - we had two boys and then two girls, so the clothes went from one to the next and then was boxed up - but now with our three, going boy (following his two sisters), girl, boy, it has gotten SO much harder. Karen ~ I had/have that with size 18-24/2 clothing.. My oldest daughter was in that size FOREVER, and then my second daughter looked so much cuter in different colors (due to their very different coloring) plus she was born at a different time of year, fitting the seasons at different times... I had just purchased a couple outfits for Rose last week, but after unpacking this size, and realizing that she has close to 50 outfits (plus extra tops, pants, sweats, and pjs), I think I am going to take them back to the store! lol! Nicole ~ I pretty much used the guidelines you mentioned for deciding what to keep. I love your idea of creating a list of what is needed! Gosh! Wouldn't that be so helpfu?! If only I was could be that organized!! I did end up getting rid of all shoes that had excessive wear, mainly just keeping dress shoes (my boys always have a pair of brown and a pair of black, which they don't wear outside of Mass, etc, so they are still in excellent condition) and all the girls shoes that match specific outfits and such. I never keep flip flops, tennis shoes, rain boots (my kids rainboots are usually falling apart before they even outgrown them!) and those sorts of shoes. OH my goodness! That is incredible! I have to admit though that I have only one tote for multiple sizes, lol. Except for big girl clothes, I hve a few of those, since I have such a gap between Daisy and Buttercup (7 years!). I did go through all the girl stuff last week and it was so funny to see things that were from my big girls that I saved that I would never put the kids in now they were so outdated, lol. I was looking through my boys things, briefly the other day and had only one tote for baby boy 0-12 months. I better go through it and see what is in there. Boys are so hard on clothes! Much worse than girls! Looks BEAUTIFUL! SO, with one big boy, two girls and one little boy... You'd think that I would have a system that would look somewhat similar to yours! BUT - I do not. I have something else entirely! I have a new policy. 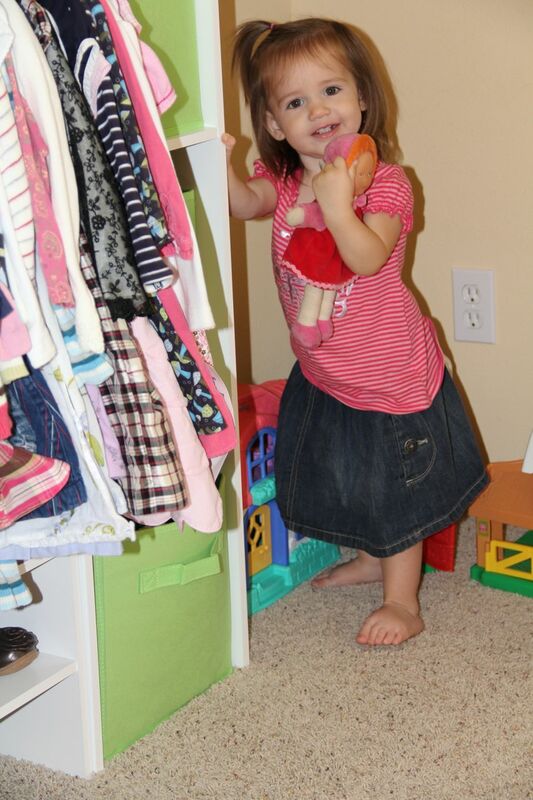 NO MORE THAN 10 outfits per child (plus only 2/3 dressy type outfits - it is nice if they are separates to mix/match!) SO, with so few outfits, they get worn out!!! SO worn out that I don't hand me down. Bud has about 5 pairs of shorts for summer and 3 pairs of jeans and 2 pairs of soft/work-out type pants. In the summer, he has ~10 t-shirts. For winter I might add one or two sweatshirts and do 8 or 9 long sleeved shirts. Easiest to explain his!! Then, those things are fairly ragged by the end of the time he can wear them! So, there really isn't much to keep for handing down when there is so little! For the longest time, We had boxes and boxes and boxes of clothes. Both grandmas bought clothes, other family bought clothes and I bought lots of clothes because they were on sale (and I thought with lots of clothes, I wouldn't have to launder so often... but, it just created a huge mountain to deal with instead.) and we had so many things that never were worn... 20% of the stuff was worn 80% of the time. SO, now we have it to where 90% of the stuff is worn 90% of the time! The only things that 'might' be worthy of handing down are dressy items - and I feel ok just donating them if they weren't loved and wanting to be kept for "prosperity's sake." SInce I have bought only one dress per girl per season, I am not losing any money if we just donate it. I used to have 10 or 12 dresses per girl by the time everyone helped with the buying! Elm ~ I loved your idea, and really thought about trying it out (I do plan to purchase very little in the future! 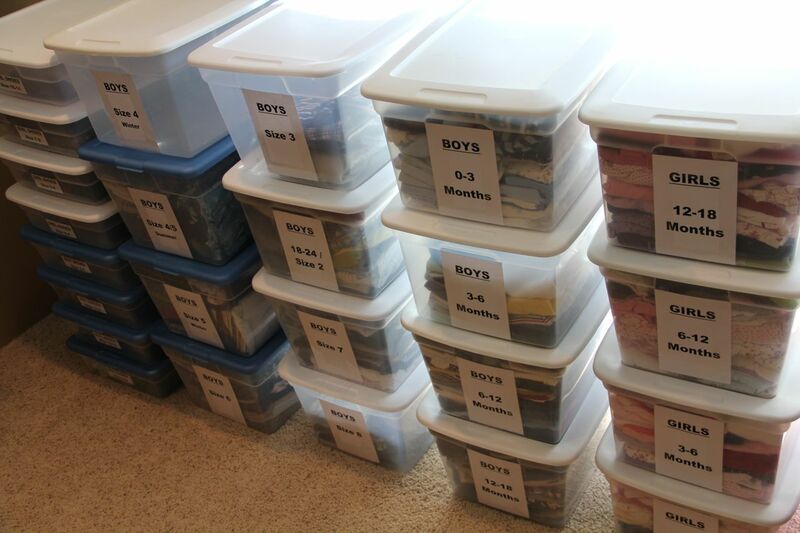 I already do that with the boys and rarely purchase them anything, since most of their clothes -other than jeans and church pants - comes from my youngest brothers), but the thought of having no hand-me-downs, and needing to buy around 70 new outfits (10 outfits x 7 kids) each year/season, sounded just as overwhelming! lol! You might be the most energetic, organized and blessed lady out there! Like Melody, my jaw is on the floor. Holy Moly! Good job! That looks *fabulous* and I bet it feel so good to have it all pretty and organized. God bless you! I actually hired a couple of girls from our parish to do this task! I organize the same way you do. I have totes for the boys and totes for the girls. I don't have any real guidelines on how much to keep. But....I have been keeping to the rule that if a new outfit comes our way that an old one goes out. I seriously, have a problem just chucking clothing. I am fine donating it or giving it away. but when a perfectly good pair of jeans gets a hole at the knee...I can't bear to throw it out. I have stacks of clothing that might be "useful" for something. Geez, I need some help! I store shoes in the same box they came in. The kids usually have sandals, play shoes, dress shoes and sorta in between good enough for weekday mass yet ...still not dressy enough for a tie shoes! I am so in AWE of you! Is there any way that you can mail me your organization gene?..i just want to borrow it for a month or so! haha! Everything looks wonderful...it looks like you will be ready for your newest little Blessing...little peanut! ( no idea what your nickname for this one is, so I had to come up with my own) God bless. Wow! I just did a seasonal wardrobe change this past weekend. I label everything, too. BUT, nothing quite as FANTASTIC as what you have done! Please rest and don't burn yourself out. Continued prayers for you and the precious little baby boy in your tummy! WOW!!! Great job! You really MUST do a post on that protein shake you mention. I've been seriously lacking in the energy department with this pregnancy. We have an age gap between our older two children and younger two, so we try to store as little as possible, and I usually end up donating quite a bit each season. But I have to say, it is hard parting with some of my daughter's dresses (I get a little sentimental - esp with the younger outfits! ), so kudos for passing on so many of your little girl things!! I have also had great success with protein shakes! Same thing - I have so much more energy when I drink them (even when I am not pregnant). Lately I've been mixing the powder into greek yogurt for even more protein-boost :) (23 grams per serving...) and blending it with frozen fruit & a banana to make it all taste a little better, LOL. Great job w/ the organization, Jessica! Love it! 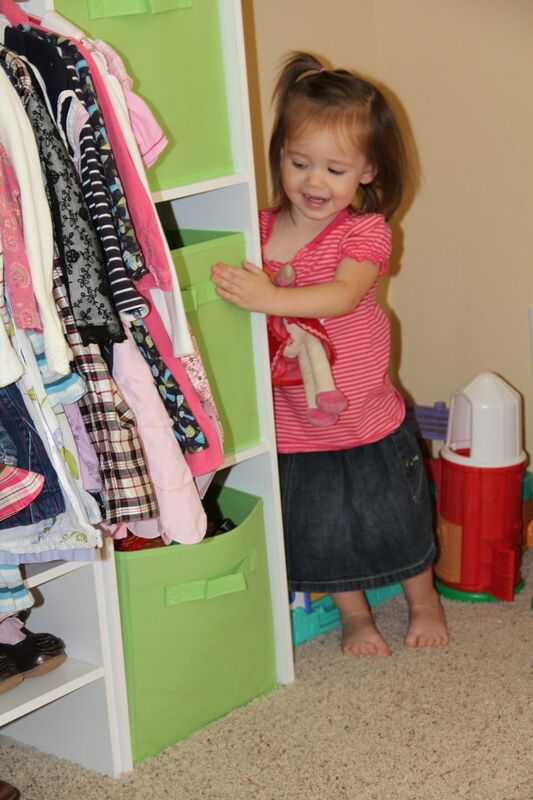 Just wondering....what size totes do you use to store your kiddos' clothing? Mary ~ The majority of the totes are the 58 qt clear storage totes from Sterilite and the shoes are in 28 quart clear storage totes, though I did use some larger totes we already had for some of the larger girl sizes. We had quite a few of them already, but I did pick up a few more (to replace some of the larger totes I was using) at WalMart... The 56 quarts totes were only about $5 each. Your system looks great! 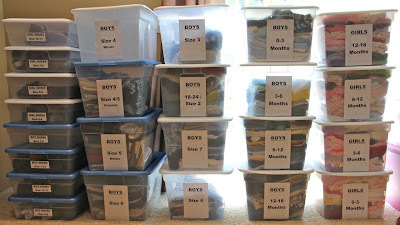 I have my boys stuff separated by seasons and my "big boys" clothes in one tote (these are things I have gotten from other people or I find dirt cheap and put up for later) and my "little boys" stuff in another. My two youngest boys are almost 3 years apart but wear the same size most of the time. My 5 year old is shorter and chubbier and my 7 year old is a tiny bit taller and thinner so I pack thier stuff together. By time they both wear items, I don't even save thier hand-me-downs unless it is something really nice. Also, do you store winter outer-wear in the tubs, too? Amazing! I love reading your blog. Inspirational. How do you get this kind of thing done during the day? God bless. This is too funny - I use the EXACT same system with our clothes! I even have the same exact bins and make signs on the computer too! Just curious...What do you do with your own clothes for when the seasons change? I have a giant tote in the bottom of my closet and I switch the clothes out twice a year...Unless I'm pregnant... That's a different tote. Sterilite must love people like us! 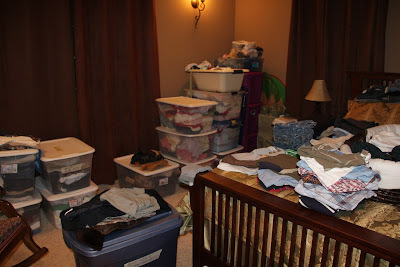 Katie ~ Other than storing my maternity clothing, I pretty much just leave all my clothes in my closet year round. I do have a good size walk in closet, and my husband has his own closet, but after we moved all the kids around a few years ago, my closet has become more of a storage room for all the craft/school supplies and books that don't have homes, so it is in desperate need of another organization. I have three spots for hanging clothing, one where I keep all my skirts, dresses, and jackets, and then on the other two bars one has long sleeve tops and sweaters and the other has short sleeve tops and a few other misc items. I did pack up a tote this last fall with clothes that no longer fit that I really hope to get back into some day, and that seems to be my biggest problem... my size changing so drastically every few years. Wow. Such a great idea. I have a lot of long sleeve tops, and pants I just took out of storage for winter (and by that I mean bags). I'm going to go out tonight and buy some containers for my summer clothes and then reuse them for the winter clothes. Maybe next season it will be alot easier to find the clothes I am looking for!